Zach "I don't think Bobby would stab me in the back because he's such a pu$$y..."
9:30am Big Brother wakes up the house guests. They block the feeds and when they come back – Bobby and Bruno are out in the hot tub room. Bobby and Bruno are talking. Bobby says its hard to know what information to release and what information to give out. They continue talking game in the video below. 9:45am – 10:20am In the Storage room – The Bromuda Triangle alliance have a meeting. Kevin, Zach and Jordan are talking. After Jordan and Zach talk about Kevin has no idea we have Pilar and Ashleigh down. Zach says I talk to B just enough each day. She is an emotional player. Zach tells Jordan to stay close to Sarah. Out in the backyard – Jordan and Zach agree they need to win the next two HOH’s. They talk about being worried about Willow. Zach says I don’t think Bobby would stab me in the back because he’s such a pu$$y but he would get someone else to do it. Bruno joins them. They talk about how they think the HOH will be a question competition. Bruno asks if Johnny is still fighting. Jordan and Zach say yes. He’s not giving up. They talk about how much of a great guy Johnny is but that he has to go. Bobby joins them. The conversation turns to talking about the Veto power and when Bruno told them about it. Zach says I thought you had to use it. I was sitting there just sh*tting my pants. Bruno says if I didn’t win this, it would have changed everything. This is the chance to get him out. 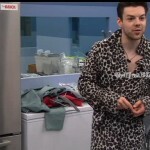 Zach says if anyone gets voted back in it could be GingaNinja. He would blow this place up. We vote him out and they (viewers) vote him back in. They agree Kevin can’t win HOH. Bobby says he thinks the next 4 weeks will be easy. They wonder about how many how many jury members there will be either 7 or 9 with the possibility of Canada being one of them. 10:20am – 10:40am Jordan and Zach continue to talk in the backyard. Zach laughs at the fact that Bobby thinks the next 4 weeks will be easy. Zach talks about needing to take out Bobby and Bruno and that they would need Brittnee to take out Ashleigh and Pilar. Zach says you can read it all over B’s face. Jordan says yeah she’s an open book. Zach says I would like to get Willow out in the next few weeks. Zach says I want to get Ashleigh to get in the hot tub with Bobby and convince him to throw the HOH. Jordan agrees and says to tell her to tell him this is an easy week. Bruno and Willow join them. In the living room – Kevin, Johnny, Brittnee are talking. Kevin asks Johnny if he had to quit his job to be here. Johnny says his job let him take the leave of absence. He says I’ll be able to go back to it as long as I didn’t say or do anything that would get me fired, which I don’t think I did. Kevin asks him about his job and schooling. Out in the backyard – Bruno, Willow and Jordan are talking. Bruno is talking about his kids and sports. Sarah and Brittnee join them. The conversation turns to talking about extreme wealth. Sarah says she thinks they should put a cap on inheritance like 50 million and whatever’s left goes to help others. 11:15am Out in the hot tub room – Bobby, Zach, Sarah, Pilar and Ashleigh are hanging out. 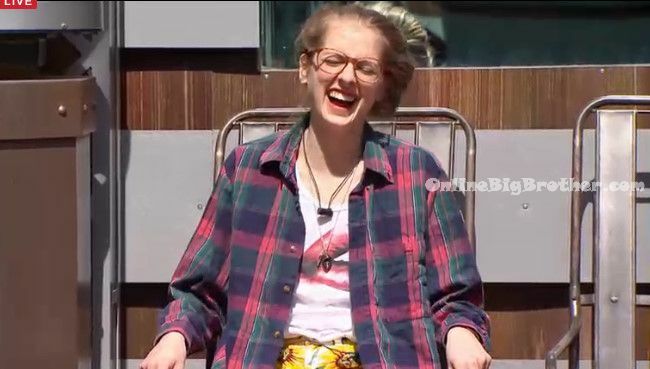 Sarah says that on Wednesday she’s going to wear a dress that she thinks Neda would like. Ashleigh comments on how she was hungry and tried to get into the pantry and it was locked. You know how horrible that feels. Godfrey joins them. Sarah shows them her rocks. Brittnee, Johnny, Pilar and Kevin join them. 11:25am – 11:45am Jordan tells Sarah that she talked to Kevin last night and she won’t be going up in any situation. Sarah says that’s good. They head inside. Jordan tells her that Willow is throwing Sarah and the couples under the bus. Jordan talks about how Graig wasn’t built for this show. Too emotional. Sarah says if you gave him a good pitch he would switch. He always kept the door open for people. Sarah says we’ll keep this just between me and you.. the competition do you think it would be things in the house? Jordan says I know Arlie thought that last year and he went through the house and counted everything. Jordan says I don’t know it could be. I think it will just be a before / after or A & B comp. We’re set if it is. If Willow, Godfrey throw this HOH and Zach convinces Bobby to throw it then we have a good chance to win it. Sarah says and then we’re at jury. Jordan says pretty soon if its not the week after next. It will be either one more or three more evictions. Jordan says there will be a Double coming soon. Jordan says we just need to push for Bruno to go home before Jury to see his wife and kids. Sarah says he would go crazy. Jordan says especially with his kid sick. Sarah says he would go crazy, you cant even make a phone call. Bruno joins them and the conversation ends. Jordan and Bruno talk about whether or not the next US season will be an all stars season. They discuss past house guests and if they would come back to play again. 12pm – 1pm Hot Tub room – The house guests are suntanning. Jordan brings up how Godfrey called out Willow and Ashleigh for having acne. Sarah runs around and kisses everyone. Godfrey says oh what the hell was that yo! Willow talks about how she’s begin gaining weight and “bulking up in bulking season”. Jordan and Kevin start talking about survivor and other shows/movies. Sarah says she wants a tattoo of Willy Wonka holding the everlasting gobstopper. 1pm Big Brother blocks the live feeds. So far, not so dream worthy. I sooooo want Zach/Jordan on the block, just to wipe those smug looks off their faces…not that I want them voted out cuz I respect people playing the game, just can’t stand their arrogance and would like to see them humbled. You mean kind of like how you play the game, Zach? Hypocrite. Why is everything okay when when someone does it themselves, but not okay when it’s done to them? I HATE HYPOCRITES! By the way, this is how Zach was talking to Peter Brown via Tweets BEFORE he entered the house, calling Peter a “little B!tch,” etc., I’m just WAITING for Peter to take notice of these things and call Zach out on them on the Side Show once he gets evicted! Wow. He is already making plans about scum acting Ashleigh and Pilar by using Britnee, so NP will still have their jury votes. They are way too obvious. Their designated spots are always the storage room, and it says a lot when people walk in instead of being invited in the meetings. Almost the entire house is onto them. Bobby will regret not talking game with the others and not branching out to others in the house. Bobby’s a dolt. Wish Bruno didn’t rely on him so much as a confidant. I do think Bruno’s game would step up more with Bobby gone….it just might be to late though. Simon and Dawg, I have searched your site and i can not find anything relating to a) Sarah using gummy bears to figure out the house alliances, b) Johnny with Sarah deciding strategy for the one surviving the the vote, to flip and attack the bromuda triangle. 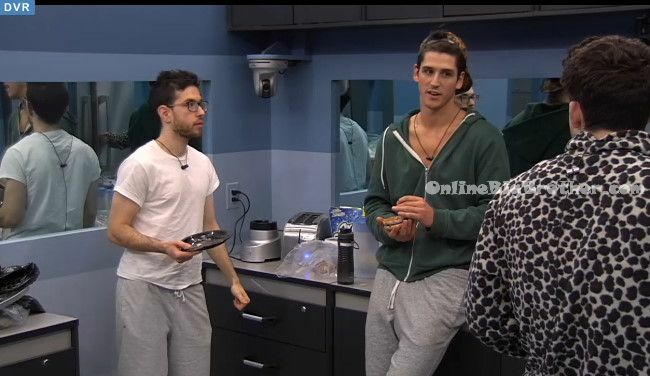 Again with gummy bears, c) Kevin telling Johnny his chances for staying are slim. This leads Johnny to talk to Zach and expose Sarah’s plan to flip (leaving out his role within the strategy), and much more info on the house. Both a & b occurred around 3-4am prior to the veto ceremony, and c occurred in the early a.m. of the 13th. Were you guys able to capture any of these discussions? The most infuriating thing recently is how Jordan is trying to convince everyone that Bruno needs to go home and see his kids because he has been away from them for too long. If I was Bruno and I found that out I would livid. Bruno gave an opening for this reasoning, and Jordon knows he is playing with a bunch of emotional players, the girls. What I am not getting is that Jordon is not considering Bruno for jury. I would prefer Bruno in jury over Ashleigh or Pili who would be votes for his alliance members in F2. Bruno would look at game more. Players like Pili don’t even deserve to be in the show, let alone casting a vote for the winner of BB or , even worse, being carried in F2 and winning the 2nd place. Can you list The Fembots (Sarah and Brittnee) in the poll? Fembots: I love the name of their alliance…….I just wish they were more deserving of the title. Bruno 100% cheated on the HOH comp and he gets 5,000 and HOH? Made the twist another flop too. If helping each other was allowed shouldn’t they have told everyone else before comp starts? okay… been doing volunteer work work today… wondering whether or not jonny’s scorched earth plot worked to save him or if he’s still out the door so far…. did I miss anything? I think Johnny is still going to be evicted. If anything he was able to bump Sarah up a couple spaces in the eviction priority list. thanks simon. missed them coming to the conclusion to get rid of jonny anyway the first time I watched the video. my bad. sorry to ask a silly question. so all he did was tarnish his own image? okay. If pilar was actually entertaining to watch and wasn’t so boring I wouldn’t really care that she’s doing nothing. Come on big brother .. if your going to cast people who do nothing in the game at least make them entertaining. we need more talla’s in this house now she was really fun to watch.